It's high time that I updated this Installation Guide. I hope this latest effort, I can make things simpler than ever. For best results/hackintosh experience. Update to HP Mini 311 BIOS - F.15. You can install the stock HP F.15 BIOS which can be installed in Windows or icelord's de-whitelisted version (which unlocks the PCI slots) by manually flashing the machine. BootCD-altPS2.iso - burn this onto a blank CD-R. I recommend using the slowest setting to ensure no write errors occur. Snow Leoaprd Mac OS X Retail DVD - 10.6 base up to latest, 10.6.4 currently, should work fine. DO NOT use the restore DVD's that are shipped with real Macs (won't work) but get instead the store-bought shrink-wrapped copy from your local Apple Store or Apple Reseller. Current Project Release - HPM311DP HF6 Installer.pkg as we speak. External USB DVD drive - there HP Mini 311 models with sales packages including a Light Scribe external DVD writer drive. With the DVD drive connected to the Mini 311 (with enough battery of course or plugged directly to an power outlet), load the BootCD-altPS2 disc you've just burned. As you power on the Mini 311, press F9. You will see a boot menu list. Use the arrow keys to choose your DVD drive and press Enter to boot from it. When Chameleon has loaded, you'll see list of icons representing drives in your system to boot from. Manually eject the DVD drive and replace BootCD-altPS2 with the Snow Leo Mac OS X Retail DVD. Wait until the drive fully loads the new DVD you've inserted as indicated by the drive's led light and/or until you hear it's finished loading the new DVD (some light mechanical sound and then drive becomes quiet). Press F5 to refresh the Chameleon boot menu. Normally, the "Mac OS X Install DVD" entry is added at the far right of the horizontal row of drives available. Use arrow keys to select "Mac OS X Install DVD" and press Enter key. Once you've selected the language, go to Utilities > Disk Utility and format the drive with "GUID Partition Table" and "HFS Journaled (Extended)". I also suggest you name the resulting volume "Macintosh HD", just like in real Macs. After the installation, you will get an error message that the "Installation Failed". This is perfectly normal; OS X only told you that cause it's detected that the hard drive is not bootable which is something we'll deal with later. Use the same BootCD-altPS2 disc to boot up Mac OS X on your HP Mini 311 for the first time. Just choose the "Macintosh HD" drive icon in the Chameleon boot menu. Install the Mac OS X 10.6.4 Combo Updater. Do not restart yet. If you do accidentally hit that "Restart" button, you can always use the BootCD-altPS2 disc to boot up your Mini again. Run the HPM311DP HF6 Installer.pkg to set up EFI on the hard disk, thus letting the Mini 311 boot on its own without the need for the BootCD-altPS2 disc. Restart the computer for changes to be applied. Congratulations on your Mini MacBook 311! - Disable "Use secure virtual memory". 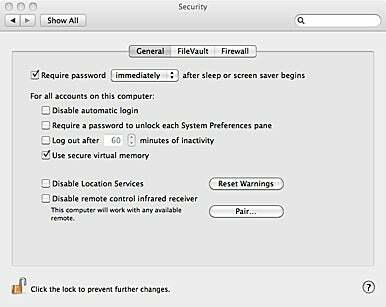 System Preferences > Security > General tab > uncheck "Use secure virtual memory". It would require restarting for the change to be fully applied. We do this to help ensure Sleep function has no problems on our hackintosh. Replacing the 311's WiFi card. Ideally, we keep the stock card for Bluetooth functionality. List of Snow Leopard Compatible WiFi modules and other details on the HP Mini 311 Darwin Project. I also downloaded Empire EFI iso's and included in the 512MB USB where I can combine to use on other generic laptops and desktops. I love seeing the booting process now lol all my friends are shocked. Thanks a lot for this guide ! I have not hackintoshed a single PC yet. The Mini 311 will be my first try. I've got a Mac Mini with its 10.6 "CPU Drop-in DVD". If I put the hard disk out of the Mini 311, and then in a Firewire or USB "external hard drive enclosure" hooked to the Mac Mini, I will be able to install Mac OS X 10.6 on my Mini 311 hard disk. Of course, I would then put hte hard disk back inside the Mini 311. Would that work with a Mini 311 ? I guess that I should then jump to step "3. Setup EFI", but if you would be kind enough to give a step by step guide, I would appreciate It. Hey LeMaurien, I need help... I used your edited HF4.pkg on my friend's mini 311.
his was fine with original HF4.pkg so i'm sure it's the edited pkg that may casued the problem..
After reinstalling HPM311DP HF4, try booting with -v -f first. Then reboot with just -v (default for HPM311DP HF4 so you need not deliberately specify it). What's the model and spec of your friend's Mini 311 btw? Specially amount of RAM installed? You start with Step # 2 - NOT 3. And you'd need a "booter" that would provide you the pseudo EFI environment you'll still need even if you installed Mac OS X onto the Mini 311's hard drive using a real Mac - that doesn't make things different. I also want to thank you for the detailed guide, LeMaurien19! I do have some questions of my own in regards to compatibility. Would you mind letting me know if the audio input/output both work? Also, does HDMI (video out) work? And lastly, what kind of battery life do you get with OS X? Thank you so much! What worries me is the scintillating gist : "You need that same "pseudo EFI" environment which let you run the Mac OS X installer in the first place." Since I won't use a pseudo EFI to run the Mac OS X installer (from the real Mac), what "pseudo EFI" should I pick ? 4) USB Installer made bootable by NetbookBootMaker or mosslack's HF4 usb package. It's what you used to make your Mini 311 boot into Snow Leo Installer. I reinstalled HF4 and followed ur insturction and he hasn't hit a panic so far. Hey, I boot into Chameleon just fine but when it loads, my external dvd drive with the installation disc doesnt show up. The windows and darwin are the only things that are there. Could there be something wrong with my external dvd drive because otherwise it works perfectly fine except for not showing up. Hey guys, I experimented with BIOS F.14 and guess what, we can't boot without verbose mode - or it panics! Also, I noticed that the WiFi button would turn blue (it was always orange in F.04). But I can't turn on my Bluetooth even with tape on Pin 20. Anywayz, I'm back with F.04 which gives me a stable system. 1) audio out works - plug in your earphones and sound gets re-channeled to your buds, audio in, however does not. Supposedly earbuds like those for iPhone 3G and latest models of iPods - the ones with mic - should work with the 311's unijack, but the mic does not work - it's still the internal mic that the 311 sees and uses. Thank you very much, LeMaurien19! That helped me out a ton. I would like to follow your guide, but this would lead to a Mac OS only hackintosh. I'd rather make a triple boot hackintosh (XP / OS X 10.6.2 / Slitaz Linux). Can you please tell me the additional steps or point to a triple boot guide that would be compatible with your guide (if it doesn't need to reinstall XP, it is a plus). Is there a link between your "HPM311DP_1109CHF4.iso" and ? I really need help. Here's an update to my problem. I will guide you step by step. I'm using the bootmyiso method + external dvd drive using a retail copy sl. I boot into my usb flash drive. It says launching Grub. A menu loads and there is 'Memtest86+' and 'HPM311DP_1109CHF4'(what i named it) as options. I enter into 'HPM311DP_1109CHF4' and another menu loads. The options I have here are 'HPM311 Darwin Prject' and 'Windows NTFS'. My external dvd drive is connected and according to the guide I should be seeing 'Mac OS X Install DVD' but it doesn't show up for me. I refresh but nothing turns up. I reinsert the dvd, it runs, but nothing shows up in the menu. I figured it was my samsung external dvd drive that was giving me problems but I tried using a Microsoft HD-DVD drive for Xbox360 and got the same result. I then figured it was my bios which was f.14 unwhitelisted so I downgraded to f.13 unwhitelisted hoping it would work but I get the same result. refresh the list of drives (rescan) via F5. Chameleon is what makes your stuff - USB installers and such, even the HF4 ISO has it. Key is research, or in layman's terms: Google. I don't wanna disillusion anyone here that I'll cater to each and everyone's request/needs so I won't promise any dual-boot or triple boot guide. I understand why you won't write a guide for an install you do not need. Thank you for your help ! I searched extensively, but guides are based on various methods that may be incompatible with yours. They all are very unclear, whether an installed XP partition will survive the re-partitioning or not, and if it will be able to boot after the chameleon thing. MBR and the various boot-loaders are quite unclear to me. oh man, that is awesome, thanks!!! You are the best, i thought that i was going crazy by getting those errors, no worries about sleep then!! I decided to buy the Mini 311 and try hackintoshing for the first time. With the help of your guide, everything went smoothly. Thanks! However, I do have one problem. My video performance is awful. I could just barely watch SD videos on Hulu. Making it full screen made it even worse. I installed Flash 10.1 beta 3, and it didn't seem to help much. Do you have this problem as well? I installed Win 7 to see if it was because of the low specs (I'm just using what came with the laptop), but the flash beta in windows increased flash performance tremendously. I can watch YouTube 1080p content connected to my external monitor without a single hiccup. Let me know of any future suggestions, and once again, thanks! Actually, flash is still an issue, not just with hackintoshes alone but with real mac even. Flash 10.1 is a big no no on the 311 - my personal apologies for not specifically giving attention to that on my blog as I thought everyone was lurking at the insanelymac thread for the HP Mini 311 Darwin Project and has read the warning there. I followed the guide and it worked great. I now have a working hackintosh ... thanks a lot everyone whose helped make all this possible. The last step (for me) will be to get wifi working, and this means buying a new wifi card. Any recommendations? i try dual boot with Windows 7, but only work if i install installer on the ISO. when install the new version of edited HF4 installer they don´t boot. How long does the install take? Looks like the install is hanging at 29 minutes. hmm.. Following this guide works great. MS Office, iWork, iPhoto etc. are all running perfectly. One problem, though ... the machine doesn't like waking from sleep. A grey veil drops down over the screen and a message says, "You need to restart your computer ..."
What can I do? I read somewhere that installing more memory helps. is anyone having any hibernate issues? Try going to System Preferences > Security. Check whether you have "Use secure virtual memory" option enabled or not. I'm not familiar with HDMI on the 311 (I don't have HDMI tv so no way to test) but what I do know is that hibernate supposedly works on 3GB RAM installed. 1st thanks for your tutorial :-). Finally I got a dual boot OS X 10.2. and Win7 working. But still some things are not working. As I didn't want to replace the Wifi card I use a Longshine USB stick for WLAN. Works fine. Now I need a solution for bluetooth too cause I can't activate BT inside OS X. Is there any software based solution or kext that helps or do I have to buy another USB stick. Any recomendations? Has anyone gotten sleep working correctly on the 311? I sleep mine and it never wakes up again. I had the exact same issue. I believe the problem was that the hp 311 was not supplying enough power to properly power up my external usb drive. I mean my external usb dvd drive had its own power source but regardless the OS would never show, and just like you I tried windows and SL. I was also using F.13 at the time. My resolution was to have a friend that has a MAC make me a backup of SL to a usb drive from his mac. So basically get someone with a MAC to make a backup of the retail version of SL to a bootable USB and you'll be good to go. That or you can try another external dvd drive. Here is the guide, good luck. Hey LeMaurien got a couple of questions for you. Currently I have my 311 up and working fine on icelords f14 with 3gb of ram with a dell 1510 for wireless and I have a dell 370 coming in this week for the bluetooth. My goal is that I would like to have a wireless solution if possible for both keyboard and mouse to use with the laptop lid being closed as I will be connecting the 311 to an external monitor source via HDMI most likely or vga if I have to. Are there any known issues with bluetooth keyboards and mice not working with the laptop being closed? Is this supported? Does it work? Do I just need to leave the laptop lid open? Just some questions I haven't been able to find concrete answers to, and I wanted to check to see if anyone out there had tried this and what peripherals work best for this type of configuration. Any input would be greatly appreciated! Also if anyone has any suggestions on good 2.4ghz or bluetooth wireless devices keyboards/mice that are working good on their hp mini 311's I'd be glad to hear from you for tips. Anyone confirm ALL works ie graphics (qe/ci, audio, wifi)??? Not going to go through all that only to find its not all working! Anyone after a dual/tri booting guide for SL on your 311 here's one that's good. You should follow it to the letter, its not as thorough as LeMaurien19's. If anyone can prove me wrong, please do! Very interesting site, Hope it will always be alive! I'm having trouble. Basically I did everything as directed, and I've even installed snow leopard on my dell mini 10v with no problems. For some reason, the hp mini 311 i'm trying to install this on won't boot from the usb. It will ask me either to boot from "MAC OS X Install DVD" or "WINDOWS NFTS" but even after i selected the MAC OS X Install, the computer just restarts to the same boot option screen.. over and over. But I've no ethernet connexion. You'd need a different card, the stock HP wireless doesn't work. I have a Dell 1510 card, and also have a Broadcom 4318 that works. Bear in mind that if you use the half height slot then you'd need to de-whitelist with the bios hack, but if you use the full height slot then there's no need. So if I use the Broadcom 4318 chip do I have to do any Bios hacks and if so where would I go to find a tutorial or info on this? My other question is does sound work on mini 311 ? F.15 BIOS sits there "still waiting for root device"
^Your Mini 311 comes with F.15 bios already? I did update mine to F.15 (stock/non-hacked) and it boots fine. Did you try booting with HF4 installed to a USB flashdrive? I used this guide to install OSX 10.6.2 on my mini 311 but sleep, ion and speedstep is not working. Thanks for the great guide! I was able to hackintosh my hp 311. For some reason, I can't seem to update to 10.6.2. I have the "use secure virtual memory" unchecked. When I try to update, it says, "this volume does not meet the requirements for this update." Any help would be appreciated! Hey, thanks alot for this great guide. But i keep encountering an issue. im running the HF4 off of a CD and i have my portable hard drive with the .dmg file on it, and whenever i tell hf4 to run the files on my portable hard drive it says "BOOTMGR is missing. Press ctrl+alt+del to restart." Please help! Those are weird symptoms which I didn't encounter. Sorry if I can't provide any answers. And as such, I can only to refer you to my good friend, Google. In addition to my previous post. Where did you guys get the right resolution? After the installation of after the installation of the HF5 package? please please help! i did everything above went with the netbook boot installer. I can get into osx but as soon as i reboot without my usb drive plugged in i get a ktext panic error. What's the problem? I need some help here please. I installed mac os 10.6.3 and Win7 in dual boot with chamelion boot loader and it worked fine. Well somehow i managed to mess up the the efi partition. Dont ask me how. Its just not shown anymore in diskpart. I can boot win7 trough a usual system start up and Mac OS AND win7 trough a HF5 boot CD. When going into diskpart, it shows me the mac partition (100GB) oas partition 1, my win7 partition on 2 and a adittional FAT32 partition ob 3. Going into the windows drivemanagmenttool it shows me unused diskspace of 200MB which used to be my efi i guess.... mmmhgrr. Installing the HF5 bootloader again doesnt do much except messing up the win 7 mbr. :) So... what to do? There could be a less painful fix but there are so many things that could have caused it that it's best to start again - not ideal, but if you follow the guide carefully, you can be sure of getting a working system again. any solution for greater battery durability and to try the fan is not working consistently? What is USB0 in HP mini 311 ?? i get it now who wake up the system automatically. USB0 is bluetooth which is on original wifi card. if i turn off this device first by pressing wifi button before going to sleep, everything is OK.
i guess this HPM311DP_063010HF6RC4.pkg still doesn't fix this. ^Which PCI slot do have the stock card in for BT? I have mine moved to the full-height PCI slot and it's working fine. stock BT/802.11n card located on full-height PCI slot. there is 802.11g card on half-height PCI slot. ^Looks good then. Wireless button should now work fine. Remember that when you shutdown the Mini 311 with the BT off, it won't be available/detected the next time you boot into OS X. If you've left BT off at a previous shutdown and find that BT is unavailable in OS X, just press once the wireless button, just as if turning it back on - the only difference being that the indicator light remains orange/red - and then restart the machine. The wireless button should now be glowing blue, signaling BT is switched on. That should sort it out. So remember to switch BT back ON again before you shutdown the 311.
as i mention earlier, using Mini 311 Retail Pack 0.7 won't have this issue, even entering sleep without turn off wireless button. Hi not sure where I posted but I stated in my prior post that I could not get the stock wifi card to work even though it is a non-bluetooth module which in the end wasn't a big deal. ^I've no idea why you shouldn't be able to put the 311 to sleep with Extra folder copied off from the Retail Packs directly. Yeah, I tried that already and still nothing. I will try the whole process over the weekend on a seperate drive... I did everything step by step... flash bios, de-white pcie slot.. GPT partition scheme, also reset bios to default turned off security feature in system preferences. Just to note if anyone has the sleep problem even with the stock 1GB memory it will work if you boot off of the BootCDaltPS2.iso after install of the combo & HPM311xxx.pkg just reboot off of the BootCD then choose the internal drive. I will post back any progress. Thanks for this great guide! Much easier than other ones I've tried. I just have one issue: after installing OS X alone (through USB + netbookmaker instead of DVD) everything was okay. However, once I upgraded to 10.6.4 and install the HF6RC4, and restarted, my screen is a bit fuzzy. Any ideas? Did you apply netbook bootmaker/netbook installer on the Mini 311's internal drive OS X? If you did and then afterwards used HF6RC4 for 10.6.4, then you're running a spaghetti mess. If you only used netbook bootmaker to make the USB DVD bootable for the installer AND restoring the original OSInstall.pkg (netbook bootmaker puts in its own version of that file, which can cause problems for us Mini 311 users) it could be fine. And there should be NO reason why HF6RC4 should cause problems (other than the rare KP and blank screen on wake issue but certainly NOT fuzzy screens like you describe). For those reading my blog, please pay attention to the tags. Some stuff here are ONLY for the HP Mini 1001TU and NOT for the HP Mini 311. I don't know how many times I have to repeat myself but people should NEVER mix up these boot methods. Oh to clarify on that, I DO NOT advice Netbook BootMaker method on the Mini 311 because I don't have experience with it (my experiments with it weren't satisfactory so I haven't observed an installation using this boot method). I prefer EFI boot for the HP Mini 311. And this is what the HF releases are. There are posts here that have netbook bootmaker, but as far as I can remember, they're ONLY for the HP MIni 1001TU. Remember to look at the tags closely. hi there! thanks for a great guide!! i was hoping if you know how to fix the ehthernet problem that doesnt work after wake from sleep! and i was wondering if i had to isntall osx again after installing a new wifi card like the dell 1501! :) thank you very much and keep up the good work! Sorry but ethernet working after wake is one of those little glitches that we, hackintosh mini macbook owners, will have to live with at the present. I think the dell 1510 should work fine without having to reinstall OS X. I should say, I think any wifi card could probably work without having to reinstall OS X. At the most it could require adding another kext (as in the case of my old Broadcom4312hmg card). ohh nice then! it shouldn't matter when i get my wifi card... :) thanks for everything! and i got my mini macbook as same as you! with 3 GB too! :D i put that to run 7 all right! :D. so keep me posted if you find anything new on it! thanks! P.S love the passion you have for this! I want to thank LeMaurien for this blog... I succesfully installed snow leopard in my hp mini 311-1065la without a single error... even the installer doesn't show any, and it goes to sleep and awakes flawlessly even with the virtual memory checked... and i'm using wireless 4312hmg from my sister's dv2. Is there any update with flash 10.1 video accel or theres no hope in that? and I installed with onle one big partition... it's possible to make a partition and install win7? Glad to hear this positive report! :-) It's admittedly a welcome change from all the negative reports. I haven't figured out how to make Chameleon, the bootloader, to be able to see an NTFS formatted volume on the 3rd partition (after OS X) if you want a dual-boot, the Win 7 partition should be the one right after EFI. ^I tried a Win XP/Snow dualboot but it wasn't successful. Only a Win XP Pro SP2 installer was available to me at the time and I remember I had to slipstream Ion drivers for the 311. It was problematic for me and so I didn't do any further attempts. But that doesn't mean it cannot be done; a wealth of info can be found at our very own InsanelyMac or MyHPMini.com - although you might have to adapt the instructions, if you find a tutorial, to the 311. Thank you so much for the guides, helped so much!!! Thank you for the guide, everything went well. I bought a U100 soon after they came out and I've been running OS X on it for quite a while. The mini 311 is certainly a step up. I was a little disappointed that the trackpad is seen as a mouse but it does work well. Wake on lid open is nice. I'm purchasing a Dell 1510 card which seems to be the way to go for me. The bios update was successful. Good work done by everyone involved! Is it possible to install a triple boot with SL, Win 7 and XP? I'm doing my first HP 311 hackintosh and having a wake/panic problem; and some of your download links are broken. Installed 10.6.4, with latest chameleon (wouldn't boot the hard drive initially, had to install HPM311DP-HF6, now it will boot the internal drive. FYI - the HF4 package and the BootCD-altps2.iso as been deleted from Mediafire - can you post new/mirror downloads to these? Now, when I close the lid, wait for it to sleep and reopen the lid, after about 3 seconds the 311 panics, forcing my to restart it by holding the power button. I do have the 'use secure virtual memory' unchecked and the 311 still panics on wake from sleep. Any suggestions? Try rebuilding your Extensions.mkext using Mkext Tool. Restart with -v -f options. Check it out! It is now possible to run Final Cut Pro on the Hp mini. I want to let all hackintoshers know. It worked flawlessly on my Compaq Mini 311c. No issues so far (besides no audio on HDMI but that's a minor one to me). I think I will replace the stock wifi card soon to enable WLAN and keep OS X on it. The only major disadvantage I experienced is the battery life. It dropped from 5 hrs (Windows 7) to 2 hrs on OS X. Are there any tweaks available to enable better power management for the atom and the nvidia ion? Hi Lemaurien i was contemplating the idea of making four partitions with my 640GB Hard drive (Partition 1 500GB Windows 7/ Partiton 2 130GB Mac OSX SL/ Partition 3 7.5GB Snow Leopard DVD/ Partition 4 2.5GB Windows 7 DVD) would this work or would there be conflict in the boot sequence. I guess I'll give it a try in a few days when I get the chance. Since I need my flash drive to carry other data. If you could give me some feedback I would greatly appreciate it. The HPM311DP_063010HF6RC4.pkg installer links on this blog are no longer working. Anyone have a copy or know of somewhere that I can get it? Thanks! The first link is working - it actually directs to "HF6 Installer" (no more "063010HF6RC4"). Here's a link for a quicker ref: HF6 Installer. Im going to try this later today, just one questions, the BootCD-altPS2.iso link isn't working should i use BootCD-VoodooHDA.iso instead? Its taking forever to download, more then 11h. Something wrong? Perhaps it's time to try HF7c? I'll have to find HF6 in my local HD...if I still have it. hi i have update to 1.6.6 but no usb found any suguestion? I also updated to 10.6.6 and everything works perfectly for me. Hi! thanks a lot for all the information, by the way as klenovsky said the bootcd-altps2.iso os no longer available, so can you please re-upload the file. Thanks. Hi Im using hpm311DP_1109chf4.iso to install 10.6.3 dvd. It loads up, and sees the os x disk, and my linux partition. WHen I select the install dvd, everything seems to be going fine, and lines are loading, but it restarts my 311, and keeps trying to boot into slackware via lilo. I dont get it. Any help? I cant seem to get the install dvd to fully load. I have it installed using just BootCD. Nothing else would work. BootCD-altPS2 is nowhere to be found. After installing HPM311DP HF6 Installer.pkg it sees my atheros card, as airport extreme, but when I open system preferences it freezes my hp mini 311. Upon reboot, I get kernel panics, and once it does load same thing happens when trying to configure airport. Reinstalling now, and starting over. Reinstalled. Everything seems fine until I try to configure the atheros card. It freezes everything and gives me kernel panics, as soon as I click ok. Still havent tested sleep. Still in 10.6.3 currently since this fresh install. I've just now bricked my 311. 2 days of life :(. Now i hope the hp assistance bring my mini to life!. can i install leopard without have to flash manually bios? what happen if i dont do this? BootCD-altPS2.iso? Link is dead. Please will you repost? Wow!! 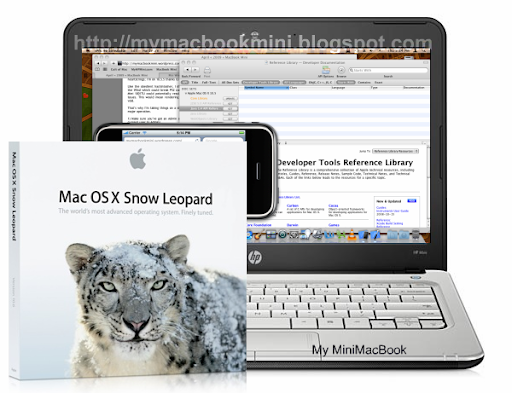 Such a wonderful guide on how to install snow leopard on a windows PC. But not everyone is too sharp to follow these simple steps. Well, if someone is looking to buy a new hackintosh laptop then I have a better solution for such buyers. I remember a list of hackintosh laptops where I found the best one for my needs. You will surely find the best one for your needs at an affordable cost. Well, Well, Well, My Baby's Done It Again! Time For A Cool Change?